My ANA first class expectations were quite high going in, so I was ecstatic when they were exceeded. 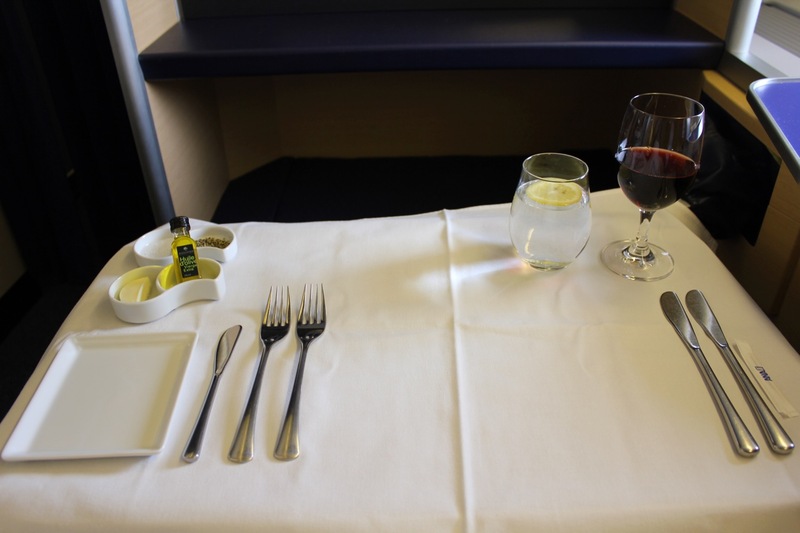 The seat and service were exactly as expected, but the meals onboard were not just great, but tremendous. This review is from 2016. I outline my reasons behind publishing older flight review here. Further, note that Gary from View from the Wing just published a “brand new” ANA first class report, which confirms that very little has changed in the last two years. ANA first class passengers have access to the United Polaris Lounge in Chicago prior to the flight. In fact, the lounge is just a couple gates away from the ANA gate. An ANA representative collected me and one other first class passenger at boarding time. Even though I reached the gate five minutes before scheduled boarding time, boarding was almost complete. Like a Japanese train, it seems that ANA likes to get flights out on time…or early. Entering the aircraft, the member of ground staff handed me off to a FA, who escorted me to my first class seat. I’ve got to admit, the “ANA First Square” seat is not one of my favorite first class suites. I like the woodgrain and personal storage. The seat is comfortable as well. But I don’t like that three of the four windows are blocked. I’d gladly sacrifice the incremental storage in order to look out the windows. You can see all the storage compartments below. Again, while useful, I would have preferred to be able to gaze out the windows. Still, it was nice to be able to store my wallet, cell phone, passport, and vitamins…all of them easily within reach. A touch-screen control pad made it easy to adjust the seat into your desired position. As you can see from the suite across from me, privacy doors close between center suites if you are traveling alone. Bedding is excellent. A FA cheerfully prepared my bed while I brushed my teeth, adding an excellent mattress pad, extra pillow (Nishikawa Sangyo’s Angel Float pillow), and comforter. Small problem, however: the cabin was very warm. I was expecting that going in, but there are no individual air nozzles and it was still disappointing that the cabin was so hot. I managed to sleep for about six hours. ANA once offered beautiful Rimowa first class amenity kits to its first class passengers. Now, ANA offers Samsonite hard-shell kits instead. Pajamas and slippers are also offered. Waring: I asked for “large” and it felt like I received extra small. Get XXXL if you are a medium-large in the USA. Sony noise cancelling headphones were distributed prior to takeoff. They worked well and were comfortable around the ear. IFE featured duty free shopping, movies, games, music, and TV shows. There appeared to be a belly camera as well, but it was turned off. I watched a movie called Queen of the Desert, starring Nicole Kidman that was EXCEPTIONAL. It chronicled the life of Gertrude Bell. I love movies based upon true stories. Wi-Fi, sadly, did not work, even for a few minutes. This was very disappointing as 13 hours was a long times to remain disconnected from email. Prices are very high, as well. A flight pass is only $19.95, which seems reasonable, but the fine print caps data at 100MB. You go through that in no time. Dining turned out to be the highlight of the flight. Menus were presented in fashionable blue menu cases prior to takeoff, along with a hot towel. Service began with an amuse bouche of smoked salmon with goat cheese, Eryngii mushroom with parmesan cheese and zucchini, and Pâté de Campagne. All tasty, though the cheese pepper bars (breadsticks) were best. ANA serves Krug onboard, but I started with sparkling water. I’m sorry to admit that no matter how many times I try, I simply do not like most Japanese food. I stuck to the western menu on this flight. The table was set for dinner and I ordered a glass of Italian red wine (Pian Dell Vigne, about $60/bottle). The appetizer included crab meat and apple with caviar and shrimp, which differed slightly from the menu above. A simple green salad served as a great palate cleanser. The main cours arrived, a beautiful beef filet that was cooked a prefect medium rare (per request). The roasted potatoes and gnocchi (perhaps a bit redundant) were nice accompaniments. I also appreciated the mustard, though it was not necessary. Finally, the meal concluded with cheesecake drizzled in crushed pistachio and vanilla ice cream on the side. It was delicious. What a meal! ANA also offers an illy coffee menu to first class passengers and I enjoyed a cappuccino with dessert. I thought I was finished, but a FA soon appeared with petit fours, insisting that I try out a few things. The meal was so satisfying I could have survived with nothing further on the 13hr flight. But about two hours prior to landing, meal number two began. This one was more limited, but still a multi-course adventure. I’d call the meal a brunch, as there were elements of both breakfast and lunch in it. I started with a glass of orange juice, which was not freshly squeezed, and followed that with a cup of coffee. As you can see, the meal included breakfast breads (croissant and pastry with preserves). I started with a salad, identical to the one I had enjoyed with my earlier meal. For the main, I ordered spinach and ricotta cheese cannelloni with Italian sausage ragout sauce. It turned out to be one of the best pasta dishes I’ve ever had a on a plane. I appreciated the cooked vegetables as well. To finish the meal, I ordered fruit and another cappuccino. The western meals are amazing on ANA. I suspect the Japanese meals are even better, if that is your thing, but you’ll be very satisfied ordering off the “international cuisine” menu. I’ve never seen a cleaner lavatory. FAs carefully clean it after every use. You’ll always find a fresh seat cover on the toilet and a stand can be lowered so you do not have to step on the floor when changing clothes. The counter has space to move around and real towels are used. There’s even a bidet. 09/10 for the lavatory experience (one point deducted because Emirates, Lufthansa, and even British Airways offer far more spacious lavatories on their A380s). I mentioned at the outset that I had high expectations for the onboard service. The FAs did not disappoint. Neither robotic nor intruding, FAs provided polished, hospitable service onboard. But there was a problem: the language barrier was pretty bad with the FA who worked my side of the aisle. I was surprised, actually. The flight still went fine, but the interaction was limited. I had to point to items I wanted on the menu. She felt embarrassed, and so did I.
I was originally connecting from ANA to Vanilla Air, ANA’s low-cost subsidiary. Since internet was down, I asked the FA if my connection would depart in the same terminal. She did not fully understand me, but brought over a colleague who spoke better English. That’s great service. Overall, the FAs (all female, in case you were wondering) were superb. A shame I do not speak Japanese. I enjoyed this flight so much. I booked it last-minute, not even really thinking much about it, but I’m so glad I tried out ANA. Overall, I highly recommend the product, with particularly high marks for the service and food. Next Article Frequent Traveler University in New York City This Weekend! Still Not Too Late To Attend. My wife and I are flying this route soon, so it’s nice to hear that the experience is so pleasant. I was under the misapprehension that ANA had air nozzles, though, which is a big deal, since Asian airlines tend to keep the temperature exceedingly warm. Thanks for clarifying the point. Better to know beforehand. I’m saying it was near perfect…but a perfect 10 would be larger. So reassuring to know that the headphones worked well. 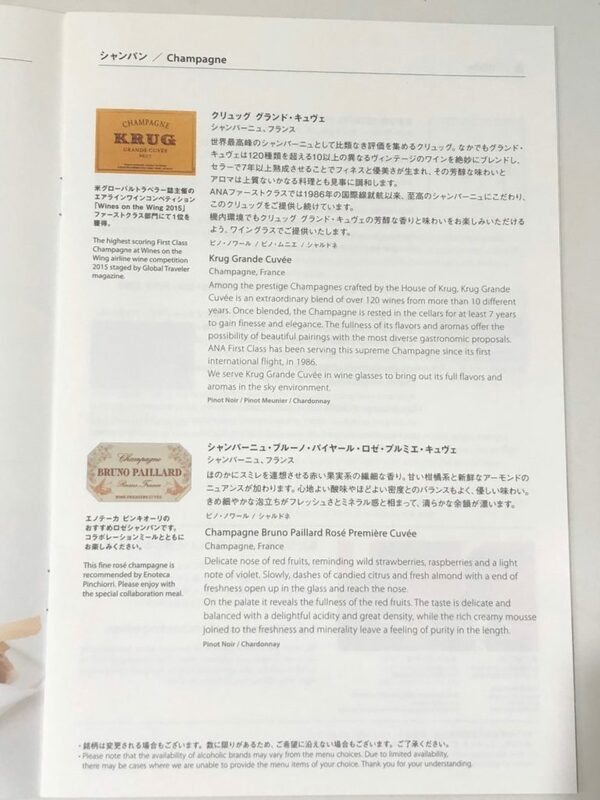 Hey Matthew – would you recommend seat 1K, being close to the galley (which I pre-selected for my LAX-NRT-LAX flights next year), or would you consider 2A or 2K if you were to fly ANA F again? Thanks, Simon. Woah, you took this flight in 2018 and they offer 100MB in a full flight pass? For $16,000 round trip, I’d like to be able to check my email without opening the wrong attachment. The part I worry about is the cabin was warm. Makes it hard to sleep. They have these small travel fans. It might make sense for you to get one of them in case of an issue like this. I think some run off USB. I just re-read this as I’m sitting in the SFO Polaris lounge awaiting to board NH7 in F. Book a RT using VS when there was a AMEX bonus. I’m dreading the cabin temp though. Jack, I hope you have a wonderful flight. Let me know how it went!